For every three wise men can be found an equal number of fools. On the eve of departure for Bethelhem, the three wise kings went to the marketplace to purchase frankincense, myrhh and gold. Wandering among the stalls they encountered a second group of three kings talking with great excitement among themselves about their purchases. "I bought a hippopotamus!" said one. The second one asked, "You mean that part of the brain?" The first one scoffed, "No! That's the hippocampus. This is an animal from Africa. "Oh, " said the second king, nodding in a way that suggested he had no idea why the first king would have purchased something so impractical. Though he quickly added, "I bought an ottoman!" The third asked, "Why'd you buy a Turkish guy? That's not very practical." The second one said, "Not that kind of ottoman. It's more like a stool to rest your feet on." The third king asked, "Don't you need a chair to sit on to put your feet up?" The second king scratched his head. "I hadn't thought of that." The group turned around and admired the hippo. "I like your hypothalmus," said the third king. "Thanks," said the first king blushing. "Let's give it something to eat. How about a kebab? Do either of you have any kebabs?" The other two shook their heads. "Hey!" said the third king, "I've got this bag of oranges that I was going to throw at some street urchins." The first and the second king said, "That sounds like fun." The third king said, "It is fun!" The second king said, "I just had an idea!" The other two turned to him, "About kebabs?" This comment gave him pause. "No. At least I don't think so." He stood there mouth slightly agape trying to recover his thought. "I know! 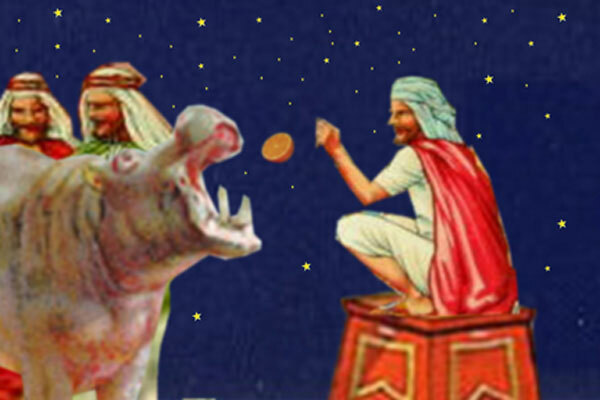 Let's throw oranges into the hippodrome." "Yeah!" the other two cried and together the three of them spent the rest of the evening doing just that.